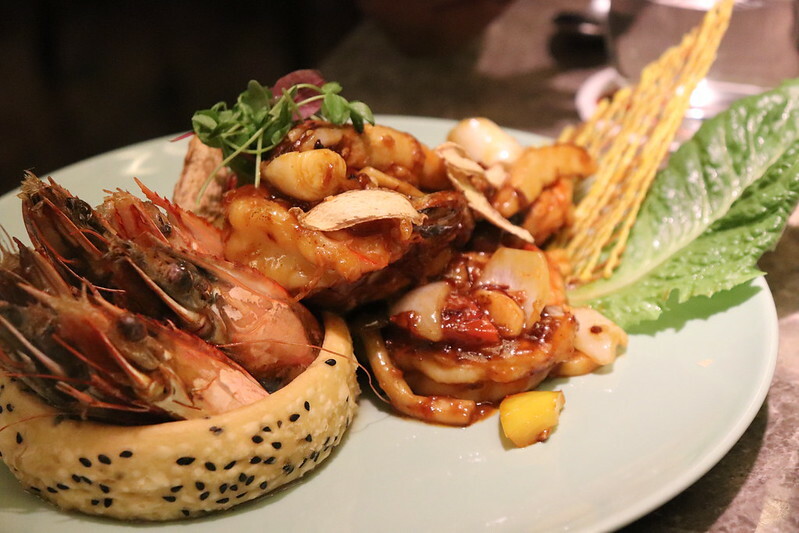 Jia is another gem from the Royal China and Kuai group of restaurants. Specialising in gourmet Asian cuisine The group has put together their all time stars and added a few new crackers to the menu of Jia. 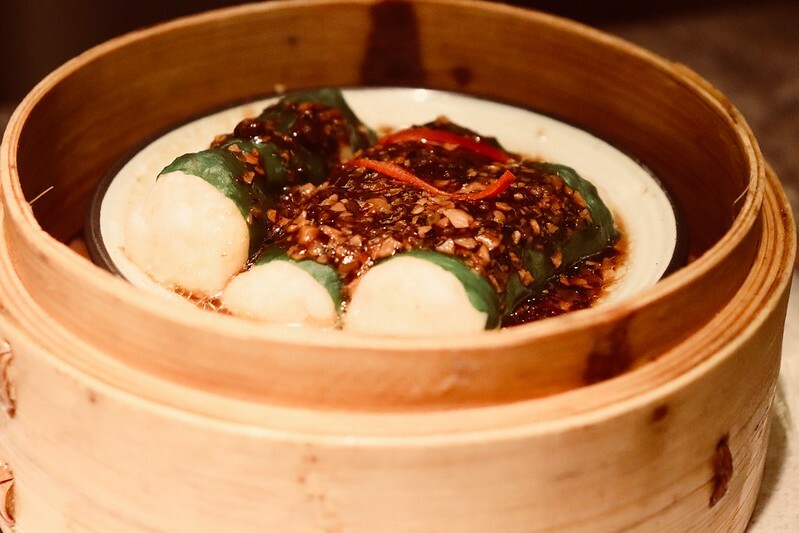 While I have always loved the dimsum available at both Royal China and Kuai, the sushi at the latter had recently proved to be a disappointment, however that too has been rectified in their newest offering. Jia has classic contemporary interiors. Very simple, mostly white with subtle hints of Chinese elements. It is split across 2 levels, a ground floor and a mezzanine with seating for small as well as large groups. We tried a number of things on the menu of Jia and since I’m on a health path we tried to avoid fried food and dessert. Here’s what we tried, my favourites are marked with stars. This one was definitely a first for me. It is a new addition to the menu, not seen earlier at Royal China or Kuai. For a sea bass lover like me it was an absolute must try and let me tell you, it did NOT disappoint. 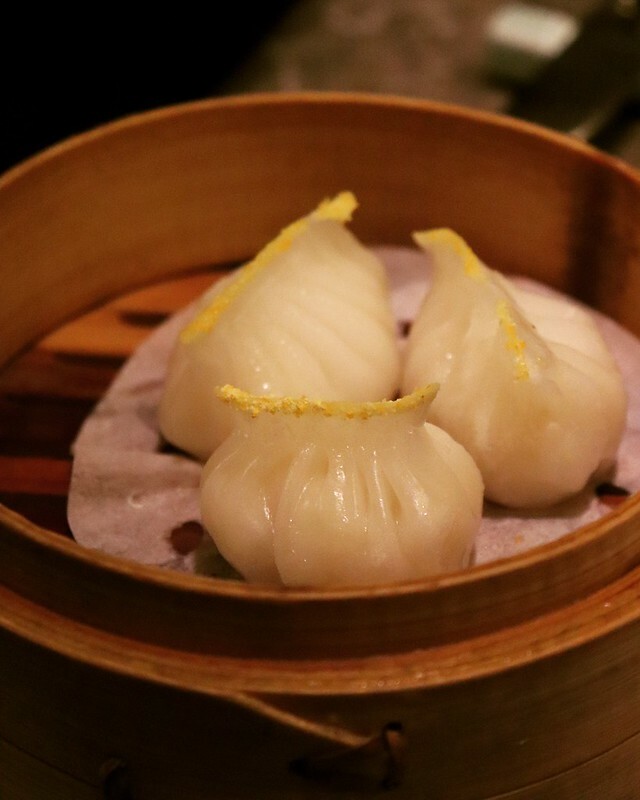 The beautifully shaped Dumpling was filled generously with a thick slice of sea bass. The spices were mild and the sea bass was allowed to be the hero of the dish. It was the most expensive dimsum of all and understandably so. Definitely recommended by me! Baos are an absolute favourite for me. They are filling and delicious. A traditional char sui recipe entails roasting the meat and then cooking it in a sweet-sticky hoisin sauce. The pork in the Bao was spot on and the flavours struck the right chords. We enjoyed the freshly steamed fluffiness of the bread and the sweetness of the filling. I have some wonderful memories of having these gorgeous Rolls at Royal China and I was hoping to see exactly the same, if not better at Jia. The dish essentially consists of juicy prawns wrapped in spinach, steamed and then topped with a soy based sauce. Although we were happy with what was served to us, I remember trying a much tastier version of the dish at Royal China. The Rolls were perfect, it was the sauce that didn’t quite work for me. Unfortunately I found it a little too salty and also felt like the garlic could be toned down as well. This dish is an ode to my love for Char Sui filling and pastry crust. 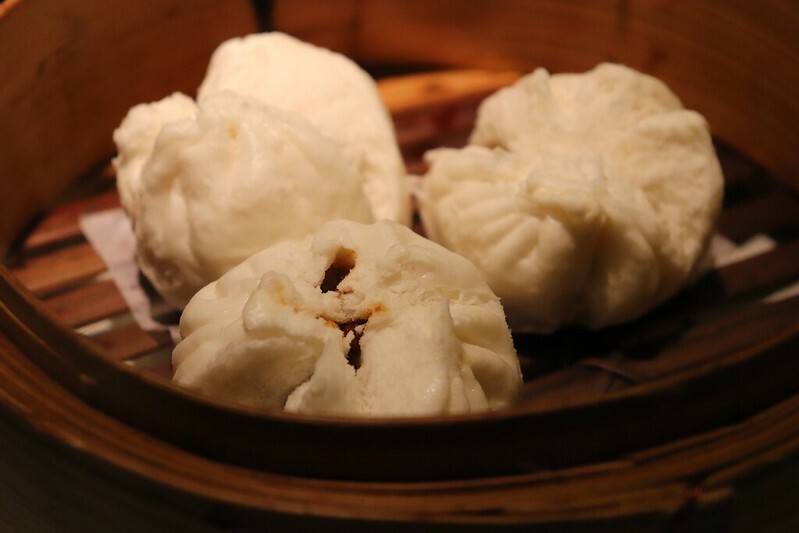 We loved the filling in our Bao so much that we decided to try it with a different texture profile. The puff was flaky, crisp, buttery and best of all, freshly baked and piping hot. Could it get any better? I think not! Honestly, I was a little sceptical about ordering the sushi but was kicking myself for not ordering more later. I would easily rate the sushi served in my top 5 of the city. Like I mentioned earlier, since we were trying to avoid fried food we ordered sushi without any tempura fillings. Here’s what we tried. This ones a real delicacy and truly lives up to its name. It consists of a centre of crabstick and its various upper layers form the colours of the rainbow. It is an uramaki roll, one with rice outside and nori inside and is topped with varying layers of salmon, tuna, hamachi and avocado. 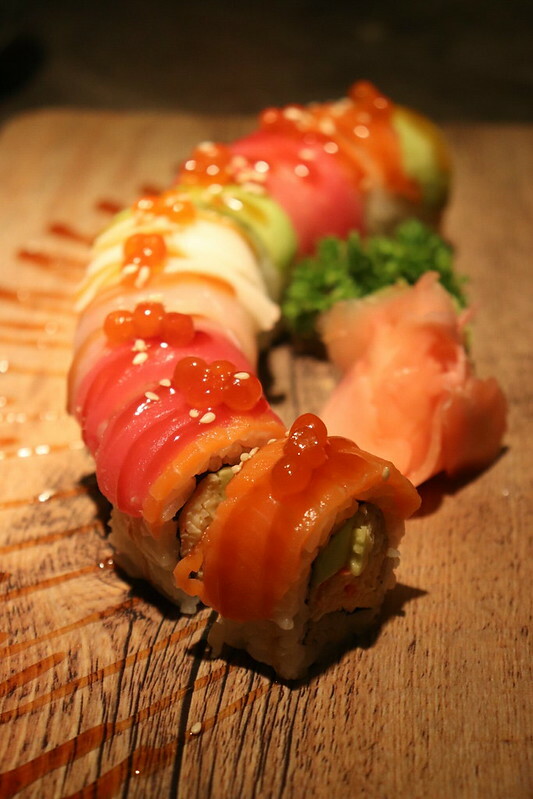 Every restaurant has their own way of preparing a dragon roll and this one surely was a cracker. 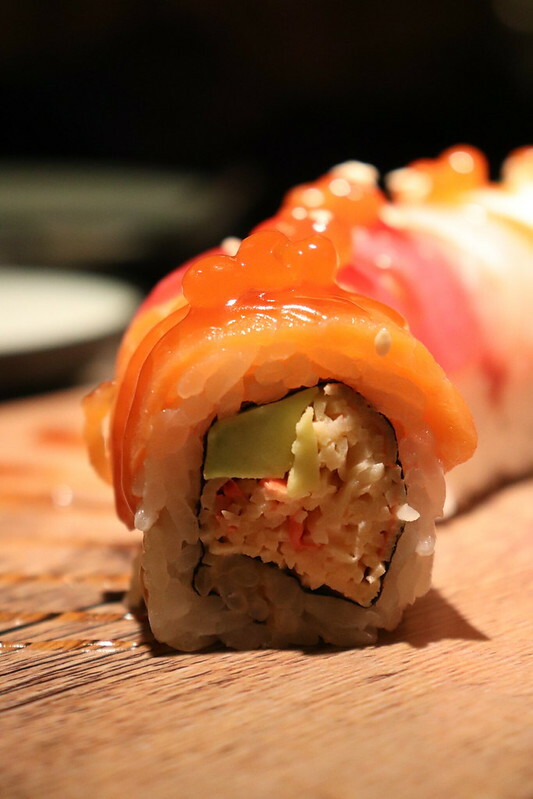 Most dragon rolls are made using more than one type of fish exactly like this one. 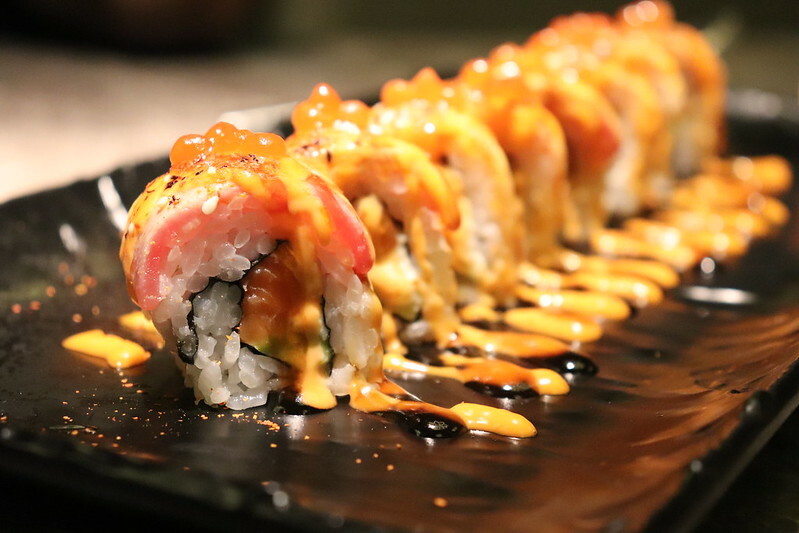 The dragon roll at Jia is also an uramaki roll made with salmon at its centre. The outer layer of rice is then topped with torched tuna and hamachi, drizzled with truffle mustard and garnished with togarashi spice. Needless to say it is mind-bogglingly delicious! I have a style of eating Chinese and no I’m talking about cutlery and chopsticks. I always FEAST on the appetisers, sushi and dimsum and keep my main course very very simple. We chose to have the much spoken about prawns in tobanjan chilli sauce and as soon as this arrived on the table, without even tasting the dish, I knew what the hype was about. Well, to start with, the platter is an absolute whopper. 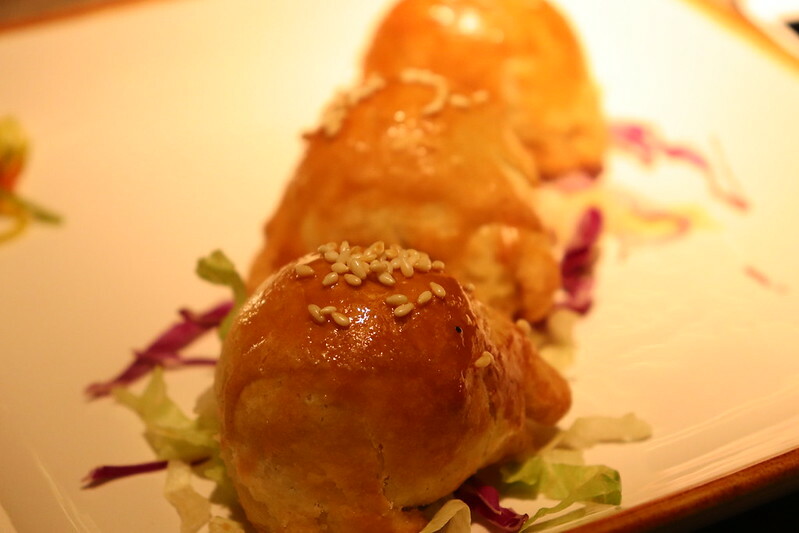 Beautiful, plump, big prawns sit aside fried prawn heads nestled in a pastry ring. It truly looks like a meal for Royalty of the Orient. The sauce itself is perfect. It’s sweet,spicy and savoury all at once and perfectly balanced. This dish is a no brainer! Just dig in! At the very outset I would like to apologise for forgetting the actual name of the dish. The name is simply one that I have given that describes my experience of it. 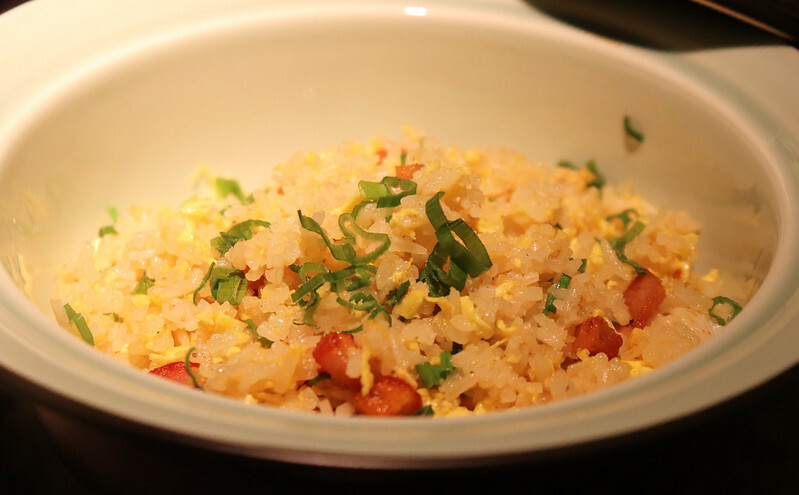 I think the fried rice made at Jia is absolutely wonderful. It is simple, flavourful, fragrant and made with just the right choice of rice. It is just these simple dishes done right that can woo customers back. I would find it very hard to believe anyone leaving the threshold of Jia with a feeling of dissatisfaction. We thoroughly enjoyed every single dish we tried and after having read about everyone’s great experience I cannot wait to go back and try all the other dishes I wasn’t able to. A hundred percent must visit Restaurant!